T he coolers most people are familiar with...a simple, proven design that will cool your house for pennies a day. These coolers are available with line voltage and low voltage thermostat controls, and are also available in side discharge models of various sizes. The line voltage control package includes a six position switch to manually turn the cooler on and off, up and down. Line voltage control is usually used when there is already existing wiring in place for a cooler. Extra electrical cost usually makes the low voltage control package a better choice if the wiring is not already in place. 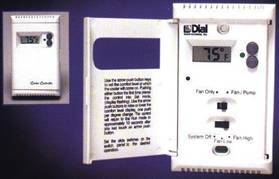 There is a digital thermostat available for line voltage automatic control. There is an Xcel Energy Company rebate of $300.00 for new installations, $200.00 for replacement situations. Installation Includes Cooler, Thermostat Control, Custom Roof Jack (6/12 pitch max. ), Insulated Duct System, Diffuser (also called "the vent"), connection to water source, Full Start-up, Annual Maintenance Agreement, Labor and Materials. Price Does Not Include Required Permits, Electrical and Upgrades You May Need to Meet Current Codes. These coolers are available in down discharge roof mount configurations as listed above as well as in a side discharge configuration, allowing additional installation options at similar pricing. * Industry Standard Rating represents a numeric index for use in comparing units of different manufacturers. Replacements for your old cooler from $2100. (FD450-MK32) Replacement Xcel rebate is $200.00. 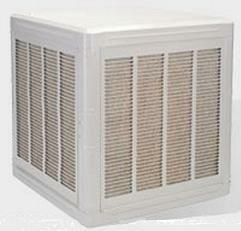 See the Cooler Replacement Section for details.